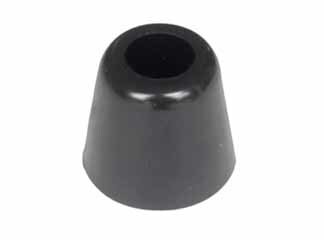 V1143 Beatle Head - Introduced in 1967, the V1143 Beatle was the final version of the "Super Beatle" head, replacing the V14, V114, V1141 and V1142 models. The name of the amp was changed from "Super Beatle" to simply "Beatle," reportedly at the request of the Beatles themselves. 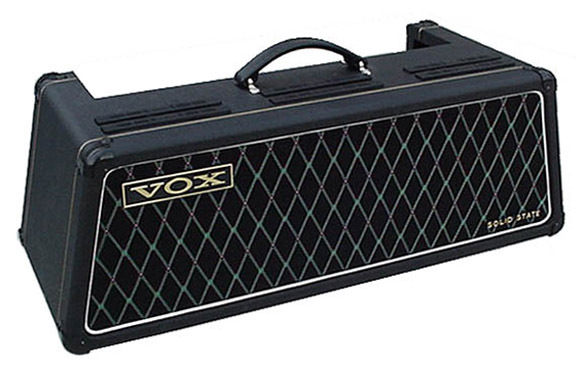 The new amp retained the same three channel design and features as the earlier models. 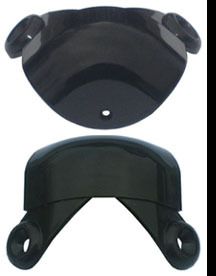 The amp was rated 120 watts RMS, 240 watts peak into a 2 ohm load. The V1143 used FET signal transistors in the preamp to minimize noise and hiss. New, modern switching FET transistors in the Distortion Booster and MRB circuits replaced the electro-magnetic relays used in the prior Super Beatle models. 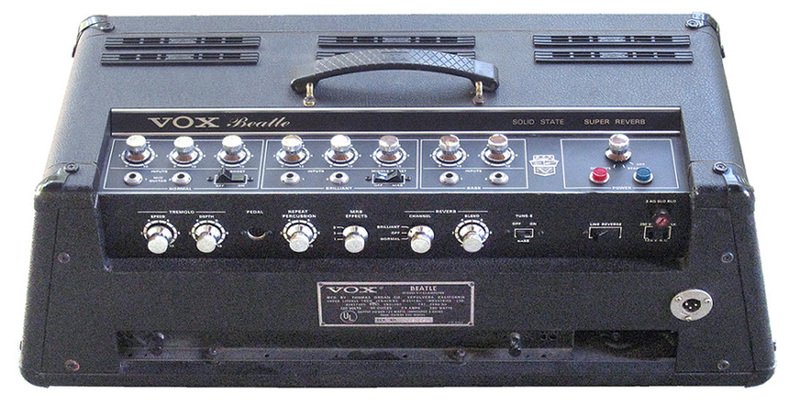 The V1143 Beatle head was offered in conjuction with the V4141 speaker enclosure as the original Beatle amplifier from 1967 through 1969 and with the Beatle Power Stak from 1969 through 1971. Channel one offers a wide range of tonal control with full bodied bass and treble response. 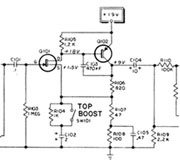 A "Top Boost" switch accented treble frequencies. 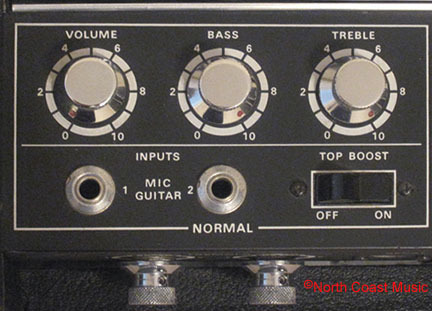 The "distortion" or "fuzz tone" circuitry was also in channel one, but there was no control panel switch to actuate this effect. The "fuzz" was turned on using the remote foot switch. Other available effects in channel one were reverb and tremolo. Channel two utilized a high pass filter circuit to effectively reduce bass response. 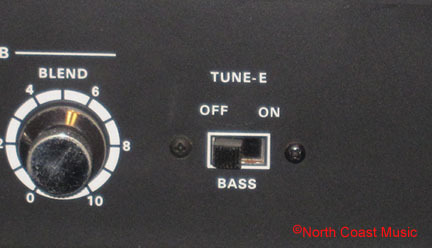 The V1143 owners manual suggested that channel two had "top boost" circuitry. This seems a little humorous as channel one actually has a switch labeled "Top Boost." Channel two is very trebly and thin when compared to channel one. MRB (mid range boost) can be found in channel two. MRB used a .5 mh coil along with three different value capacitors and a small preamp to boost frequencies 6 db selectively at 450, 600, and 750 hz. 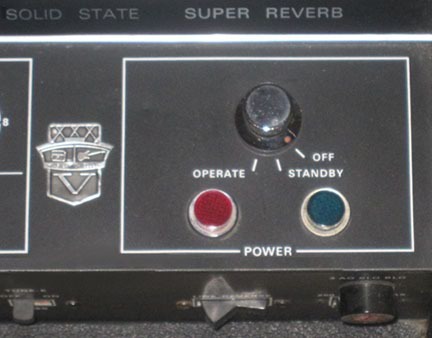 A three position rotary selector switch for frequency selection was on the lower control panel, and a rocker switch on the upper panel engaged the effect. 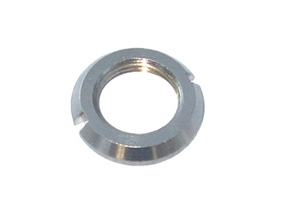 MRB could also be actuated from the included pedal by depressing...and holding down...a momentary foot switch. Channel three had only two controls, Volume and Tone -X. 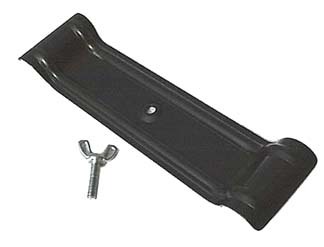 This was the "bass guitar" channel. 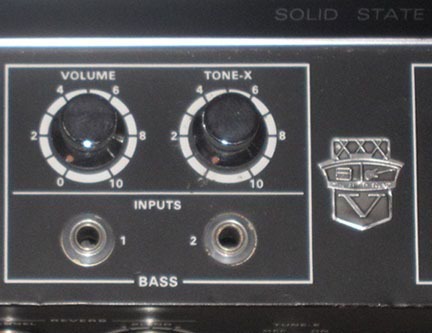 Tone-X was a tone control that replaced the normal bass and treble control. 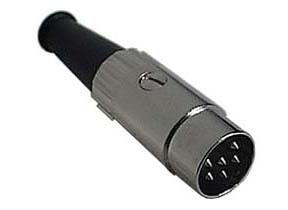 Tone-X was a sweepable EQ control that offered about a 6 db boost from approximately 50 hz (control counter clockwise) to 300 hz (control clockwise). Most people I knew that played bass through a Beatle head used Channel One. 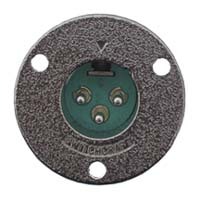 The rotary power switch had three positions. 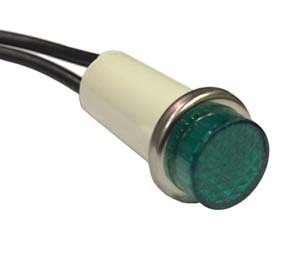 When rotating the switch from "Off" to "Standby," a green pilot lamp illuminated and the amp was turned on. The speakers were muted. In the "Operate" mode, the speakers were introduced to the circuit. One wafer of this power switch frequently broken, and the standby funtion is non functional. There are no replacements available for this switch. 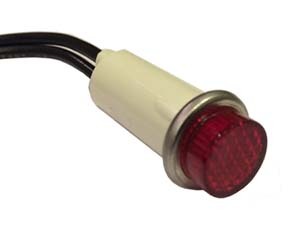 North Coast Music offers the original green and red pilot lamp assemblies for this amp, see below. 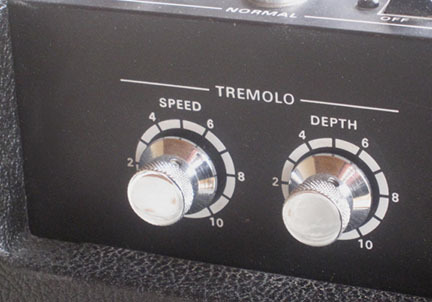 The tremolo effect is only available in channel one. 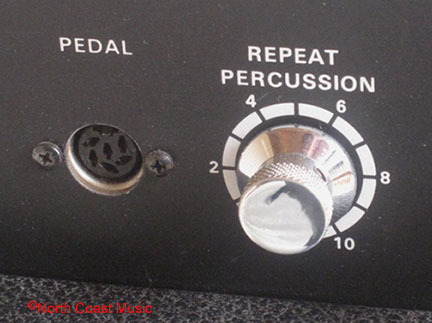 Repeat Percussion is basically "extreme tremolo." Rather than pulsing the volume of the input signal at varying speeds and depths of amplitude as done with tremolo, Repeat Percussion clicked the signal off and on in varying speeds. 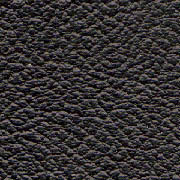 This effect was borrowed from a Thomas home organ model that used this effect to simulate the strumming of a banjo. Repeat Percussion was used in the vocals at the ending of "Crimson and Clover" by Tommy James and the Shondells. 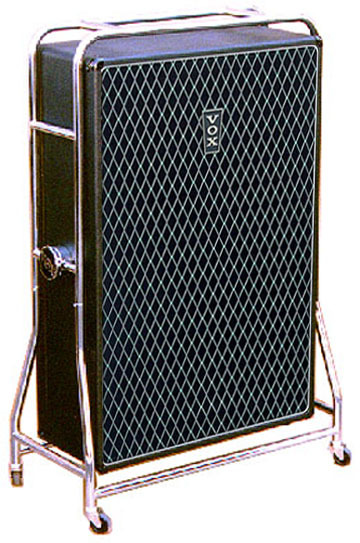 When first introduced, Repeat Percussion was unique to the V1143 Beatle amp, but in later years it also was included in the Vox Series 90 V133 preamp head. It was also sold as a separate battery powered accessory. 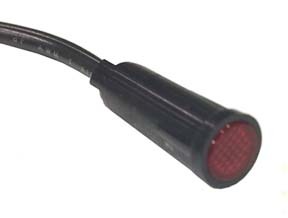 The rotary MRB switch selects between three "center" boost frequencies, 450, 600, and 750 hz. 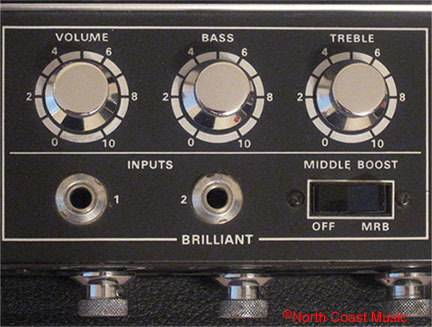 The MRB effect is engaged by either depressing the rocker switch in the channel two area of the control panel, or by depressing the MRB foot switch on the remote foot pedal. Reverb was assignable to either Channel One or Two. 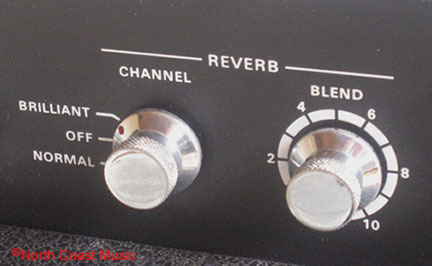 A Blend control increased the amount of reverb in the output signal. A two spring Accutronics reverb pan was utilzed in the reverb circuit. Flipping the switch for the "Tune-E" circuit played an audible "E" note to help tune your guitar. The loudness of the "E" tone is adjusted using the volume control on the bass channel. Anyone who used a Thomas amp head back in the sixties will have a story about the "Line Reverse" switch. 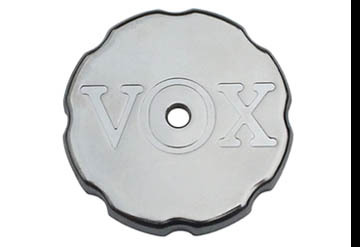 These heads did not have a grounded AC plug, so you could get a searing shock when your lips hit the microphone while your hands were on your guitar strings. Flippng the "Line Reverse" switch eliminated that shock. The amp was quote normally a little quieter when the "Line Reverse" switch was in its proper position, as well. 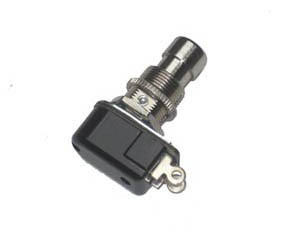 A five button foot switch with indicator lamps was an included accessory with the V1143 amplifier head.